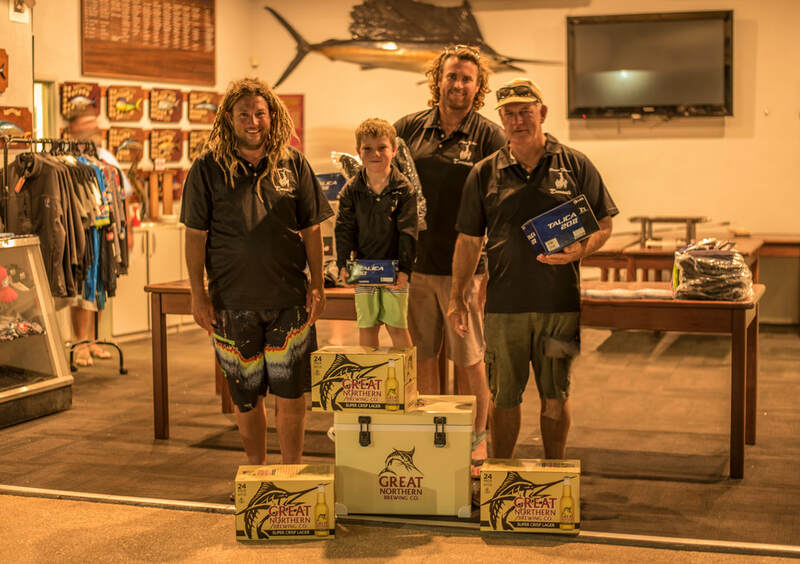 Principally timed to coincide with a unique annual aggregation of large numbers of sailfish inside the shallow waters of Exmouth Gulf, the EGFC Billfish Bonanza is also a qualifying event for the 2019 Offshore World Championship. The 2018 Billfish Bonanza featured several new categories and a revised set of rules. Pro and Amateur sections were introduced to make for a more even contest across the field, particularly on the sailfish side of the tournament. An increasing instance of shark predation of Exmouth Gulf sailfish forced to EGFC committee to abandon standard tag and release practices, instead opting to alter the tournament rules to allow competitors to ‘free release’ (i.e. touched leader counted as a caught fish) all billfish hooked inside Exmouth Gulf with the hope that speeding up the release process might lead to fewer fish being destroyed by sharks. Three weeks prior to the event the sailfish arrived in Exmouth Gulf in force, with local crews enjoying double figure days sight casting live baits to packs of sails harassing bait balls right on the surface. Many experienced locals were rating this as the best sailfishing Exmouth Gulf had seen for at least the last five years. Unfortunately, by the time the briefing evening came around the weather forecast wasn’t quite as positive, but those crews electing to contest the sailfish sections inside Exmouth Gulf at least had some protection from the strong south-westerly winds. Last year’s winner, On Strike dashed out to a good early lead on day one with 16 fish for the day including a hectic final hour bite which produced six fish for them in the final 17 minutes, while the next best boat was Pussee Galore with a solid eight sailfish adding to the total of 37 sailfish caught by the fleet for the day. 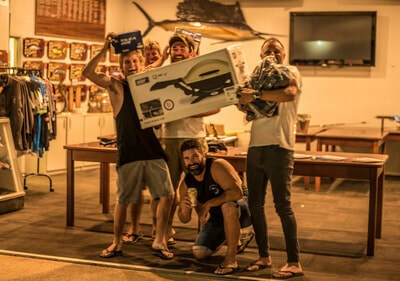 Things were altogether tougher for those crews targeting marlin off the western, Indian Ocean side of Exmouth’s North West Cape where unusually cold water temperatures resulted in just two black and two striped marlin registering on the scoreboard for day one. The remaining two days of the tournament followed that same storyline; plenty of shots for crews targeting baitball feeding sails in the gulf, while those teams chasing the marlin sections off the west side were forced to persevere to find just the occasional fish in uncomfortable seas. Of the boats sticking it out in the oceanic waters beyond the protection of Ningaloo Reef, Haulin managed to tag two striped marlin and two sailfish on day one and another stripe on day three. Salt n Pepper scored a pair of black marlin on day one, and Ballz Deep was the only other team to tag multiple marlin with two blue marlin early on day two which the team were very surprised to come across given the cold, green water. By lines out on the final day, the total stats for the 2018 Billfish Bonanza were 124 billfish raised, 110 hooked and 85 tagged or free released. This was made up of 75 sailfish, 4 black marlin, 3 blue marlin and 3 striped marlin. 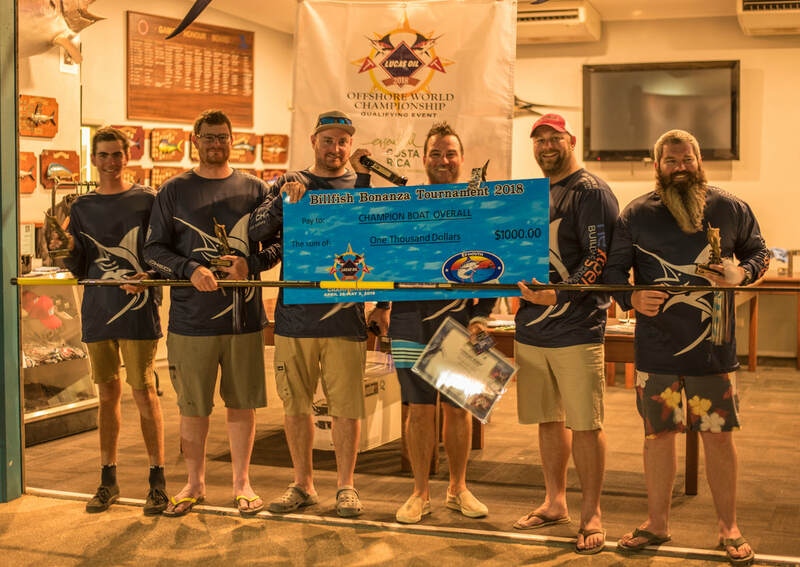 With a final tally of 33 sailfish, On Strike easily took out Champion Team Overall and Champion Team Sailfish Pro to book their ticket to Quepos, Costa Rica for the 2019 Offshore World Championship. 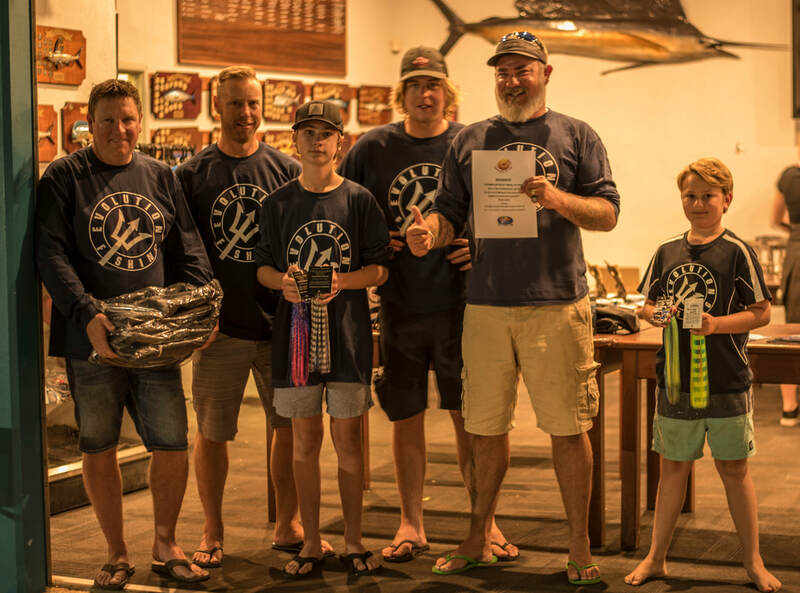 Including the team’s two pre-fish days spent practicing in the lead up to the event, the crew aboard On Strike racked up an impressive 52 sailfish released in 5 days fishing Exmouth Gulf. Champion Team Sailfish Amateur went to Pussee Galore for their 19 sailfish, including two for six year old Harvey Mitchell who won Champion Angler Small Fry. Champion Angler Junior was Will Roche from team Under Age, also with two sailfish. Haulin’s three striped marlin was enough to secure them Champion Team Marlin Amateur, while Champion Team Marlin Pro was a really close run category, with Evolution scoring a single black marlin within the last hour of the tournament to pip Valiant’s one blue marlin on line class. The EGFC Billfish Bonanza will be on again in October 2019 (dates to be confirmed). The Billfish Bonanza had 10 teams with 30 anglers, 2 juniors and 3 small-fry hit the water to target some sailfish and marlin. Both the Exmouth Gulf and west side of the cape had been producing some awesome statistics for billfish and the teams that entered were excited about the prospects. Sailfish in the gulf at this time of year can be extremely exhilarating as they harass the masses of bait that moves in to the gulf through spring. To watch this feeding frenzy is quite incredible and through this tournament many fish have been tagged over the years. Some have returned to the same grounds, while others have been recaptured further north. This year 3 anglers caught their first billfish, including 7year old Tahlia Mossman, who was very proud to have handled the fish from bite to tag. (so were her Mum and Dad!) In fact, Tahlia caught two sailfish that helped her to win the Champion Small Fry section. Champion Junior angler was taken out by Jake Fitzgerald with 4 sailfish. Champion Team Marlin was won by Team Valiant with 4 marlin tagged. Team Valiant also took out Champion Team mixed with a sailfish, as well as black and striped marlin. Champion Team Sailfish went to On Strike with 19 sailfish. The team aboard On Strike were from Kalgoorlie, Perth and Texas. Other teams came from various regions of WA, while all teams enjoyed the event with over 60 billfish raised and 40 tagged. Thanks of course, go to the people behind the scenes that make it all happen, from the event coordinator to the radio operator, the various volunteer members and sponsors that help make the event for the anglers who come to fish. I am a young lad looking to jump on a Boat for the Bill fish bonanza. I hold Master 24meters COC and great on deck, Fished WINORA and JUDE. If you need a skipper/angler, please contact Kale above. The Billfish Bonanza was one of the slowest on record! In 2015 on day 1 there were 48 billfish tagged. This year on day 1 there were a just 4 tagged. The fishing was weirdly slow for Exmouth standards, but it beats being at work! This is also the first time we recall a boat targeting marlin has taken out the overall section. There were some big marlin among the stats including an estimated 270kg blue onboard Winora. It's shaping up for the next big event of the Heavy Tackle Tournament in December.